The new 2019 Mercedes-Benz C43 AMG 4-Matic comes with the 3.0L BiTurbo V6 engine that we have been accustomed to in its pre-19 C43 AMG vehicles. However, the new model comes with a new face-lift consisting of a new designed grille, revised front bumper, revised rear bumper, a new wheel design and some changes to the interior as well, giving the vehicle a new look. With the “new look” comes some changes to power. The new model has a bump in power from the advertised 2017-2018 models at est. 367hp to a new est. 385hp. Were did this power increase come from? This new power has created quite the buzz. From speculation of larger turbochargers to just adjustments made to the vehicles ECU software. 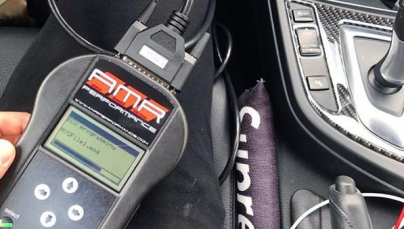 AMR Performance engineers were able to take a deeper look into the vehicle’s ECU logic and mapping as some data acquisition (data logging) done in-house on our DynoJet 424xLC2 dyno. What did the 2019 Mercedes-Benz C43 AMG do on our dyno? After multiple vehicle runs, we were able to get an average peak power of 321whp (power at the wheels) and 332wtq (torque at the wheels). Solid numbers for a stock Mercedes-Benz 3.0L BiTurbo vehicle. How does this power plot compare to the previous model? The question that everyone is asking. 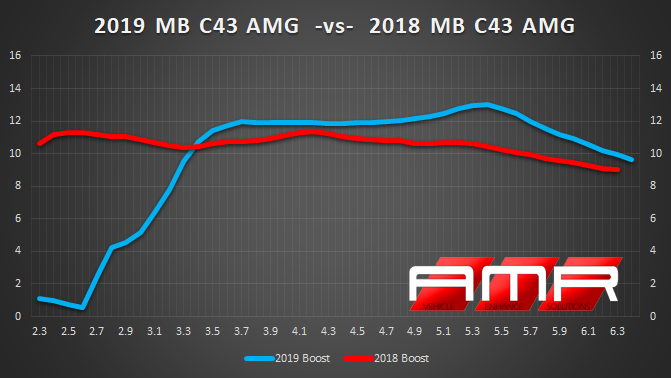 So lets overlay the stock 2019 Mercedes-Benz C43 AMG power plot over the 2018 Mercedes-Benz C43 AMG. 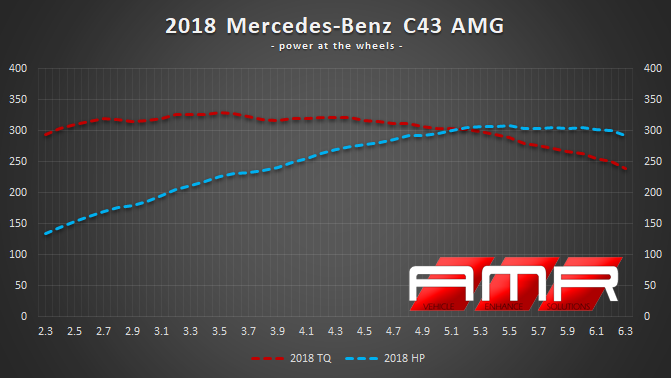 As you can see from the power plot above, the 2019 Mercedes-Benz C43 AMG pumps out an addition +13whp (power at the wheels) and +2wtq (torque at the wheels) over the previous model. Were did the additional power come from? Mercedes-AMG had tweeted a while back that “…both vehicles use the same turbocharger system just a different state of tuning. However, the new face-lift model gained additional performance thanks to a higher charge pressure”. The statement made by Mercedes-Benz, was in fact, accurate! We monitored boost readings directly from the intake manifold after the throttle body giving us a direct reading as to what the motor is seeing. The 2019 Mercedes-Benz C43 AMG saw 13psi were as the previous model (2017-2018) Mercedes-Benz C43 AMG saw 11psi. Our engineers monitored the ECU’s data acquisition which showed very small changes to ignition timing and fueling but nothing major enough cause a power effect giving the true statement that the BOOST increase was giving factor to the additional power gains. more results to come. stay tuned! Welcome our newest dealer "Manhattan Motorwerks"